This vibrant three-bedroom apartment in Barcelona, located in the Poble Sec neighborhood is the ideal choice for your getaway to the Catalan capital. A quiet neighborhood, guests can enjoy the narrow streets that are lined with many bars, cafés and restaurants, while still having easy access to all the treasures that can be found in the city. The apartment is a great choice for couples or families and can accommodate up to five people. With plenty of natural light and a colorful interior design, you are sure to feel at home. The living room has a simple design, and is furnished with a TV, as well as a dining table, where you can choose to relax after a day of sightseeing. The modern kitchen is well equipped with plenty of the utensils and appliances needed to prepare your own home-cooked meal, which you can enjoy on the balcony. The main bedroom has a double bed, while the second room has two single beds (which can easily be made into a double). The third bedroom has one single bed. The apartment has one bathroom, decorated with neutral tiles, and has a bathtub/shower. 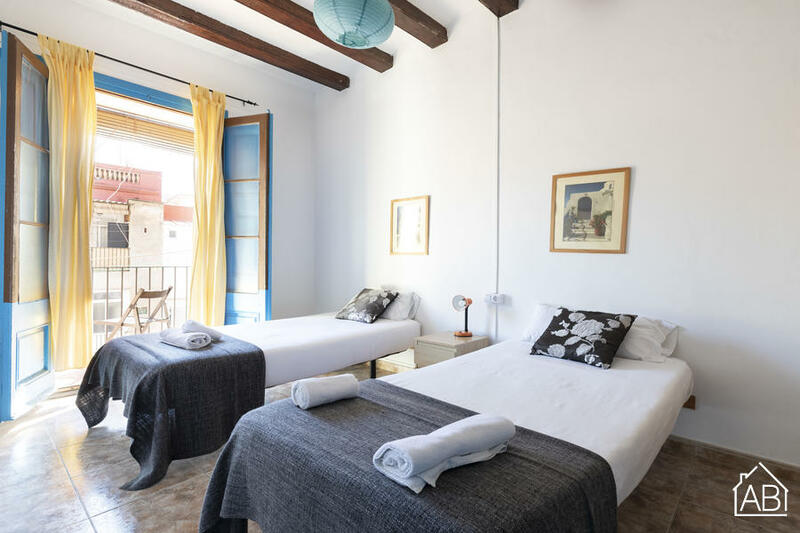 This cheerful apartment, complete with heaters, is the perfect choice for your vacation in Barcelona, any time of the year.